Saturday Special - enjoy a cheese pizza and two beers for $20! Toppings additional, see your bartender for qualifying beer choices. Fill out a Beer Tour card for FREE and order a beer. After your 36th beer, you'll earn an Ale House pint glass. After your 60th beer, you'll earn an Ale House Tailgate hooded sweatshirt with built-in koozie sleeve and bottle opener and get your name on a plaque hung on the wall. During the summer we want to reward you more for drinking really good beer with us. Between Memorial Day and Labor Day, fill out a Summer Tour card for FREE and get drinking some tasty brews with us. After you finish your 36th, you'll get a Summer Tour baseball t-shirt and a commemorative glass! Sign up for the Birthday Club and get a special discount mailed to you to celebrate during your birthday month! Pint sleeves are available! 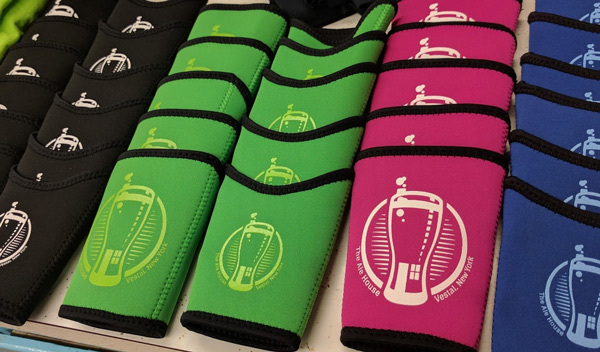 No warm beer, no cold hands with these neoprene sleeves. Just $6.00!